FORT WORTH, Tex. — Brad Keselowski dominated early and retook the lead late to win Saturday’s O’Reilly Auto Parts Challenge at Texas Motor Speedway. Keselowski led 106 of 200 laps in the 31st NASCAR Nationwide Series race of the season, propelling his No. 22 Penske Racing Ford to a decisive advantage in the owners’ standings. Passing runner-up Denny Hamlin with 14 laps left, Keselowski pulled away to win by .980 seconds. The victory was Keselowski’s sixth of the season, his first at Texas and the 26th of his career. Four different drivers have combined to win 12 times in the No. 22 Ford. Penske teammate Sam Hornish Jr. recovered from a commitment violation (hitting the commitment cone on Lap 53) to finish third. Hornish trimmed two points off series leader and fifth-place finisher Austin Dillon’s advantage and trails by six points with two races left in the season. Matt Kenseth came home fourth, but Joe Gibbs Racing teammate Kyle Busch blew a right rear tire and crashed off Turn 4 on Lap 110. Busch finished 26th and saw the four-point advantage of his No. 54 Toyota entering the race turned to a 26-point deficit to the No. 22 in the battle for the owners’ championship. 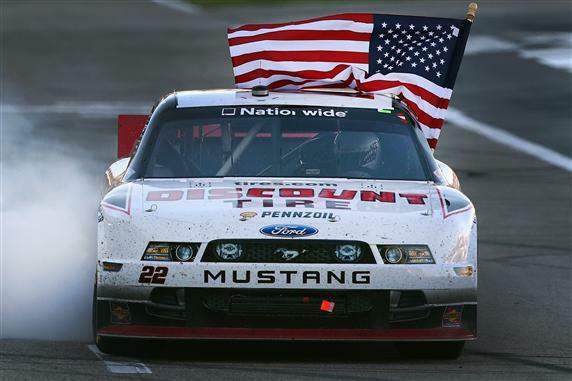 Keselowski will drive the car next week, and Joey Logano in the NASCAR Nationwide season finale at Homestead. To Keselowski, the 2010 NASCAR Nationwide driver champion, securing the owners’ title for team owner Roger Penske is a piece of unfinished business. The victory also was redemption of sorts for Keselowski’s last NASCAR Nationwide start, at Kansas, where he wrecked off Busch’s front bumper during intense racing between the two drivers. Hamlin grabbed the lead during a cycle of green-flag pit stops before the third caution of the afternoon, caused by Joe Nemechek’s spin off Turn 2 after a tap from Trevor Bayne, slowed the race on Lap 171. In tight racing after the subsequent Lap 177 restart, Hamlin held off Keselowski for the top spot, but one lap later, Travis Pastrana spun at the exit of Turn 2 and nosed into the inside backstretch wall, necessitating the fourth yellow flag. Keselowski and Hamlin battled side by side for three laps before Keselowski ducked to the inside of the No. 20 Toyota and completed the decisive pass. Hornish lost a lap serving a drive-through penalty for the commitment violation, but astute strategy put him in position to take a wave-around under caution for a restart on Lap 76. The caution for Busch’s accident on Lap 110 allowed Hornish to pit without losing a lap, and subsequently he charged to his third-place finishing spot. “It’s one of those things,” Hornish said of the early mishap. “You wear the tires here, and the track doesn’t have a whole lot of grip. Pit road comes up pretty quick, and I got a little locked up as soon as I got on the brakes and did everything I could do to try to get it whoaed up and had a choice of hitting the cone or the back of the 54 car. I figured the cone would hurt the front of my car a lot less. 1. (2) Brad Keselowski(i), Ford, 200, $69615. 2. (18) Denny Hamlin(i), Toyota, 200, $54350. 3. (3) Sam Hornish Jr., Ford, 200, $44450. 4. (13) Matt Kenseth(i), Toyota, 200, $31550. 5. (5) Austin Dillon, Chevrolet, 200, $37525. 6. (8) Regan Smith, Chevrolet, 200, $27925. 7. (19) Elliott Sadler, Toyota, 200, $26210. 8. (9) Brian Scott, Chevrolet, 200, $25150. 9. (16) Kyle Larson #, Chevrolet, 200, $25025. 10. (11) Brad Sweet, Chevrolet, 200, $24075. 11. (4) Trevor Bayne, Ford, 200, $22300. 12. (10) Ty Dillon(i), Chevrolet, 200, $21750. 13. (14) Parker Kligerman, Toyota, 200, $21225. 14. (21) Michael Annett, Ford, 200, $20800. 15. (17) Nelson Piquet Jr. #, Chevrolet, 200, $21550. 16. (23) Kevin Swindell #, Ford, 200, $20450. 17. (7) Ricky Stenhouse Jr.(i), Ford, 199, $15525. 18. (1) Alex Bowman #, Toyota, 199, $23600. 19. (15) Justin Allgaier, Chevrolet, 199, $20075. 20. (12) Cole Whitt, Toyota, 198, $20625. 21. (25) David Starr(i), Chevrolet, 198, $19825. 22. (26) Jeremy Clements, Chevrolet, 198, $19700. 23. (20) Mike Bliss, Toyota, 198, $19550. 24. (27) Landon Cassill, Chevrolet, 197, $19425. 25. (30) Mike Wallace, Chevrolet, 197, $19750. 26. (6) Kyle Busch(i), Toyota, 196, $13150. 27. (34) Jeff Green, Toyota, 196, $19025. 28. (38) Robert Richardson Jr., Chevrolet, 195, $18900. 29. (35) Bryan Silas(i), Ford, 194, $18825. 30. (37) Joey Gase, Toyota, 190, $13075. 31. (39) Travis Pastrana, Ford, Accident, 175, $18725. 32. (36) TJ Bell, Chevrolet, 170, $18680. 33. (28) Joe Nemechek, Toyota, Accident, 166, $18635. 34. (31) Carl Long, Dodge, Electrical, 105, $18590. 35. (29) Ryan Ellis, Toyota, Vibration, 87, $18522. 36. (33) Blake Koch, Toyota, Handling, 79, $11650. 37. (22) Johanna Long, Chevrolet, Clutch, 49, $17615. 38. (32) Josh Wise, Chevrolet, Electrical, 6, $11561. 39. (40) Dexter Stacey, Ford, Suspension, 5, $11445. 40. (24) Michael McDowell(i), Toyota, Vibration, 4, $11405. Average Speed of Race Winner: 144.52 mph. Time of Race: 2 Hrs, 04 Mins, 33 Secs. Margin of Victory: 0.980 Seconds. Lead Changes: 15 among 6 drivers. Lap Leaders: A. Bowman # 1-3; S. Hornish Jr. 4-5; B. Keselowski(i) 6-52; A. Dillon 53-54; B. Keselowski(i) 55-80; D. Hamlin(i) 81-94; M. Kenseth(i) 95-111; D. Hamlin(i) 112-130; M. Kenseth(i) 131-155; B. Keselowski(i) 156-170; D. Hamlin(i) 171-176; B. Keselowski(i) 177-178; D. Hamlin(i) 179-182; B. Keselowski(i) 183; D. Hamlin(i) 184-185; B. Keselowski(i) 186-200. Leaders Summary (Driver, Times Lead, Laps Led): B. Keselowski(i) 6 times for 106 laps; D. Hamlin(i) 5 times for 45 laps; M. Kenseth(i) 2 times for 42 laps; A. Bowman # 1 time for 3 laps; S. Hornish Jr. 1 time for 2 laps; A. Dillon 1 time for 2 laps. Top 10 in Points: A. Dillon – 1,107; S. Hornish Jr. – 1,101; R. Smith – 1,053; E. Sadler – 1,026; J. Allgaier – 1,022; B. Scott – 1,010; T. Bayne – 1,009; B. Vickers – 970; K. Larson # – 945; P. Kligerman – 924.